Call 911 if you see it: Stolen around 8:10 pm last night (Thursday, August 28th), behind the White Center Taco Bell. Chrysler Sebring, 1998, white, with black top convertible, license ... Read more..
Questions/concerns about crime/safety/policing in White Center and vicinity? Bring them to next week's September meeting of the North Highline Unincorporated Area Council: NHUAC Meeting When: Thursday, Sept 4 at 7pm Where: ... Read more.. ORIGINAL REPORT: If you're seeing Seattle Police and helicopters, there's a search under way in White Center after a man who stole a vehicle with a baby inside ditched the ... Read more..
Bikes parked outside the King County Sheriff's Office White Center Storefront tonight hinted at what was happening inside - the community meeting about more bicycle parking in downtown WC. Katie Meyer ... Read more..
By Tracy Record White Center Now editor It's been five months since County Councilmember Joe McDermott's newsletter touted a county grant for "bike corral" parking in downtown White Center - but the ... Read more..
No need to leave the area this weekend, with events like this: Three venues, one night, 10 bands, so far. Here's the plan, according to the Rat City Recon Facebook ... Read more.. Important reminder - if you use Highway 99 between the West Seattle Bridge and lower Queen Anne, a two-phase closure starting this Friday night WILL affect you. Here are the ... Read more..
Student(s) in your family, or someone you know, in need of school supplies? Check out this event just north of White Center tomorrow (Wednesday): Read more..
(Photo courtesy Tim Clemans) ORIGINAL 1:38 AM REPORT: A search is under way for someone suspected in a stabbing reported in downtown White Center. According to a radio transmission asking for ... Read more..
(Screengrab of City Light map added 9:49 pm - yes, it looks a lot like the one from early today!) No power? You're not alone. 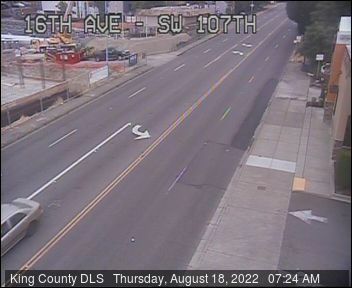 We're getting reports from Shorewood and ... Read more..
(Screengrab from Seattle City Light map) 12:53 AM: Shortly after major rain started to fall, power went out to a wide area including part of White Center. The Seattle City Light ... Read more..
A "grand reopening" is planned next month for a longtime West Seattle martial-arts practice that has relocated to White Center. Until fall 2012, Restita DeJesus operated the Seattle Wushu Center in ... Read more.. Thanks to North Highline Unincorporated Area Council president Barbara Dobkin for sharing photos from a lively Night Out gathering in NH - our apologies for delayed publication. Above, NH Fire ... Read more.. It needs 60 percent approval - and so far, after the first ballot count in tonight's election, the North Highline Fire District benefit charge has almost 70 percent approval. Here's ... Read more..
Today is Election Day and for your vote to count, your ballot needs to either be in the mail by tonight - and postmarked with today's date, with postage on ... Read more.. Though the city/county line runs down the middle of Roxbury for most of its length, Seattle is accountable for taking care of what's between the north and south curbs. So ... Read more..